Huge congratulations to Debbie Day, the better half of Mike Scholes, who checked out in Mondovi with Crispin Williams. 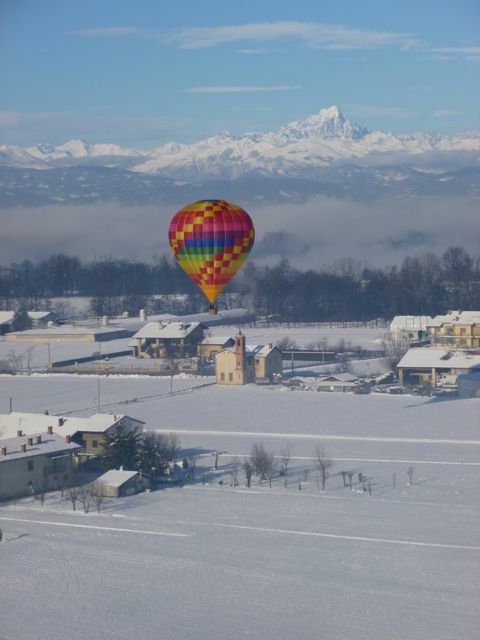 Now, just in case you have ever wondered why people are so attracted to flying in Mondovi, regardless of the time of year check out these piccies. Debbie checked out in their latest acquisition, Aidan Murphy’s very pretty Cameron Z-77 G-CCHW in near perfect conditions. Debbie told us that , “It was wonderful.” She was put through her paces before being signed off and going for her check flight with Crispin. “Really hard taskmasters those pilots out there but everyone was lovely. I laughed and cried but got there in the end.” Her training took in a real emergency when she suffered double pilot light failure over wires, which she admitted, ‘raised my pulse rate a little’. Clearly very well-taught following her successful check flight she soloed in Ken Karlstrom’s private balloon. Quite an honour. Debbie added, “I am very lucky and privileged to have had such a variety of talented people help me to gain my licence. I can only say thankyou very much to everyone.” Despite her early piloting skills making one pilot sick and causing another to crouch down in the basket when ascending she is looking forward to flying with them in the future, if they’ll get in the basket! Congratulations Debbie. Firstly a reminder that the British Balloon & Airship Club will be holding its Annual General Meeting on Sunday March 17th 2013 at the popular NFU Mutual Offices in Stratford-upon-Avon. There will be no election for new officers as there have been no new candidates standing. Dave Such had put himself forward for election but has now chosen to stand down. Having had a read through of the reports and accounts there ought to be some interesting questions raised so it should be quite interesting. As part of the AGM a motion concerning proposed increases in the membership fees has been drawn up. With all the new legislation concerning licensing due in 2015 and the need to have a Training Organisation, if pilots are to stay legal, funds will be needed to run it. The BBAC Membership has always had amongst the lowest fees for any aviation related club and revision is very long overdue. It is commendable that the proposals are going to be put to the vote rather than summarily passed by the Main Committee. For 2013/2014 the new rate for pilots is proposed to be £50 and for 2014/15, as the Training Organisation (ATO) kicks in, £65. It is anticipated that there will be no further ATO charge for BBAC pilots and pilots under training. Non-pilot membership will be raised to £40 and there remain reduced fees for second family members. Its got to be a no-brainer really and well overdue. For full details see the BBAC website in the Members only area or read the latest Aerostat. http://www.bbac.org/. February 9th saw the NFU Mutual at Stratford on Avon host an extremely well attended BBAC Inspector’s Symposium. There were a total of 40-odd attendees, almost all the current inspectors, including, rarely spotted in the UK David Barker, former Chairman of the Technical Committee. Thanks were given to Tony Greensides, Steve Charlish, David Cater, Per Lesser and Pietro Contegiacomo who have now retired. The day was focused on the lovely paperwork side of inspecting balloons and that is exactly what happened, with plenty examples of the pitfalls the inspector faces when it comes to filling in the forms various necessary to ensure your balloon is safe and fully airworthy. The event was headed up by the ever-enthusiastic ‘look it up in the manual’ Kevin Meehan, Paul Spellward and Graham Hallett with contributions from Paul Dickinson from Ultramagic concerning changes to their Maintenance Manual and interchanging cylinders (see Easy News 16.12.12. Ultramagic Maintenance Manual Update), a double act by Lindsay Sadler and Colin Wolstenholme on forthcoming changes to acceptable damage on flight cylinders, Crispin Williams on the Kubicek updates and Chris Sanger Davis who bought along Lindstrands new wire spacer. All in all a fine fun and fact-filled day with really great sandwiches and cakes. Now I don’t ‘do’ faceache although it appears I do as Jane signed me up some years ago so apologies to those that ask to be a ‘friend’ that never get a response, Jane does though and every so often something blinding occurs and I get the headsup. In an exchange between Jane and the Nice Dave Johnson it was revealed that Sue, his equally nice missus, was making scones. The things that get discussed on it beggar belief, anyway I digress. They were due over the next day to drop off a cluster of cylinders for testing. It was therefore agreed that some scones would be forthcoming if Jane provided the jam and cream. 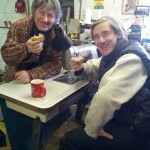 True to their word the following morning we tucked into elevenses of tea and proper scones. Thankyou very much they were truly yummy. A discount will be forthcoming. Not like that! 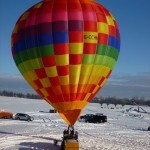 Kim Hull’s Adventure Balloons has taken over Tim Parker’s Essex Balloons Ride Business. Its only last year that he took over the Moore’s European Balloon Company and blow me down now he’s acquired Essex Balloons. Tim Parker set up the business 20 years ago, originally as Anglian Countryside Balloons back in 1993. Later he traded as Countryside Balloons before finally ending up as Essex Balloons Ltd. Along the way he has managed to get many hours out of his envelopes various. With the business went his new Ultramagic N-425 G-CGGY. His last envelope G-BZUO went to Cameron Balloon Flights and finally failed its grab test at a reported 760 hours! The fate of CCGY is uncertain but may be retained and join Kim’s existing fleet but as he is a through and through Lindstrand man the odds are against. As far as Essex Balloons are concerned there are no plans to change the name and it will continue to trade on under the Adventure Balloons Limited’s umbrella. 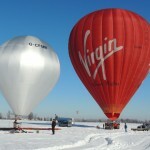 Tim is joining Virgin Balloons to operate a Group 3 balloon in his local area. 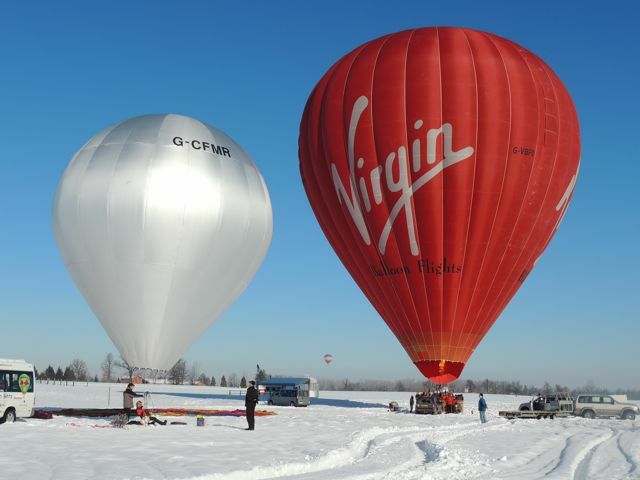 Following the recent annual Virgin trip to Mondovi, attended by almost all the examiners in the UK and most of the UK’s Ride Pilots, Virgin’s Kirsty has announced that seven new pilots have joined the team for the 2013 season. Virgin Balloons took G-VBFO along for the training week or two fitted with the new Cameron Sophie Safire burner for the stars to test. We’ll see what they said about it later! Joining the throng was Marky Shem’s old tiny Ultramagic V-14 double-skinned hopper, G-CFMR, which came along for a bit of fun and was flown by multiple World Record Holder Pauline Baker. 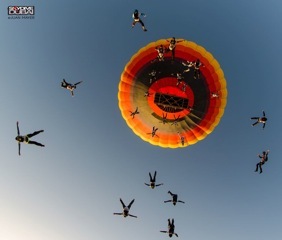 Of the new pilots that popped out to Mondovi, Virgin Balloon’s Kirsty added, “With over 100 launch sites across England, Scotland and Wales, we have a large network of wonderful pilots taking passengers to the skies all around the country. Each and every pilot is hand-picked for their expertise and experience and we’re extremely proud to have some of the world’s very best hot air balloonists working with us.” The announcement included some sweet little quotes and some spectacular name-dropping by the new pilots when asked what their most memorable flights were. Well, after much thought we gave our award to Tim Parker who managed to make no reference to overseas luvviness. This was a close call and would have been shared with Lawrie Ellis had he not mentioned competing in his private yatch. In fairness though it was Round the Isle of Wight which is not the easiest of races and is in the UK so, on reflection, joint winners. 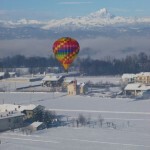 A balloon pilot was reported to the CAA, via their Whistleblower system, during the Icicle Meet. 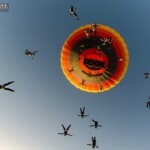 It was alleged that the Panasonic Special Shape balloon made a free flight in unsuitable conditions. 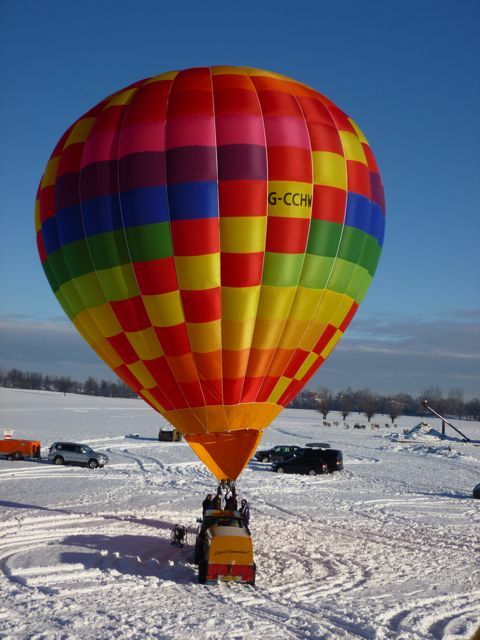 Pilot Jamie Edwards explained that during the course of moving the balloon to a drier area to deflate it that some of the handlers that were assisting let go and the balloon rose. It was quickly brought back down and successfully walked to a better area where it was deflated onto a groundsheet. Following an interview with the CAA and a lengthy discussion about the alleged incident and how if a similar situation arose could be avoided in the matter is now reported as closed. The series of booklets on the RAF 100 Bomber Group, based in Norfolk, have been revised and updated. New glossy covers and additional photographs along with revised information has meant that all seven books have now been brought up to date and moved away from the pamphlet format the were. Len’s wife has also agreed to write and publish remaining titles in the series which should mean all the 100 Bomber Group’s airfields will be covered. Publication is hoped to be later this year. Copies of the latest booklets are available from Trevor Wise at trevorjameswise@tiscali.co.uk and cost £4.99 inclusive of postage to the UK Mainland. My dog, the Collie, celebrated her birthday on the 16th February. She is now apparently nine but I thought she was eight this time round. There you go, doesn’t time fly? 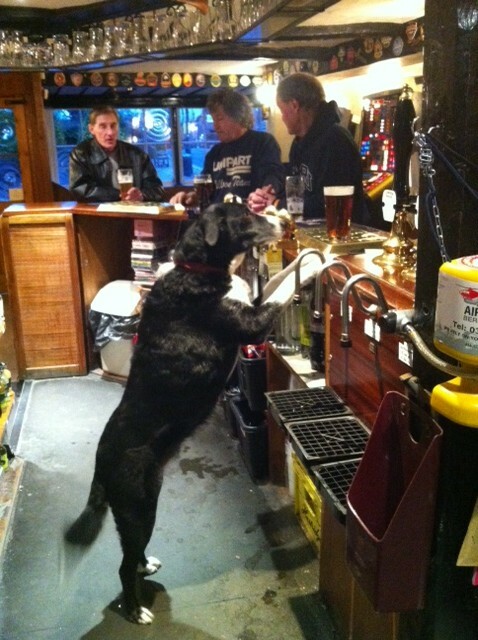 Traditionally (if its a working day) she enjoys a drink and steak baguette at the Black Horse but as its on a Saturday this year she’ll have to make do with a half in the Swan. Its good for her coat. 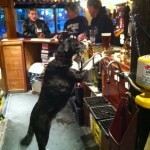 Her job serving at the Swan has had a few setbacks mainly as she can’t work the till or get the full glass from the driptray to the bar. She is very camera shy and does tend to attack cameras if she spots them so getting the attached pic involved a crisp diversion. Happy birthday Dotty. Just as we went to screen, or whatever it is these days, Richard Bowater dropped us a line to let you us know that the ever popular Bedale Balloon Meet IS happening again this year. Dates are confirmed as 14-16 June. 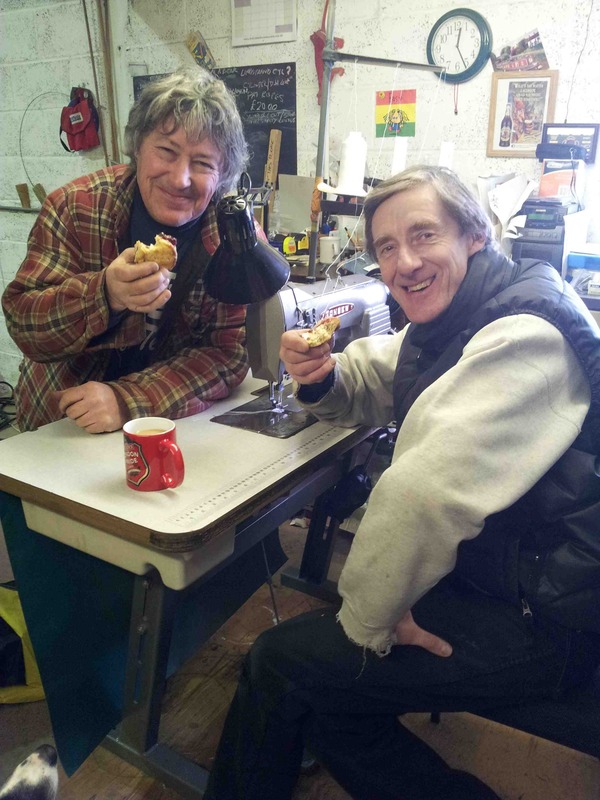 It is being run as usual by Richard and Nicola Bowater who are grateful that both Paul Wade and Mark Stelling are helping them with the flying and meet organisation. We are told there will be a few subtle changes to the successful format this year. Most notably it is not being run as Pennine Region Meet and entry is by invitation however, having said that, interest from balloonists has been fantastic and there are just a few places left up for grabs. Bedale is a great place to fly and socialize so come on up to North Yorkshire for a fun weekend, get yourself current Metz and also help celebrate Mark's birthday! Please contact Richard for more details by email richard.bowater@ntlworld.com if you would like to come. Please note this will be on a first come first served basis.